Why He’s Top 40: He’s establishing himself as one of Edmonton’s finest up-and-coming young chefs, blending creativity with practicality in managing a kitchen that can churn out thousands of meals a day. Serge Belair’s first attempts at cooking were awful. At 16, living with his dad after his parents’ divorce, he decided to take on the role of cook. But he enjoyed making dishes from scratch and, soon, his dad was enjoying them, too. 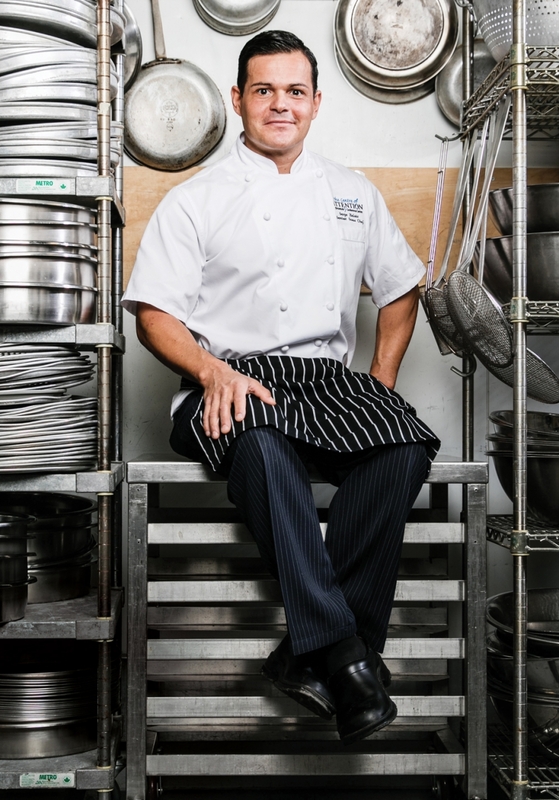 After high school, Belair enrolled in culinary school in his hometown of Gatineau, Que. It turned out that he was good at creating recipes people enjoyed, earning him great grades. In 2005, Belair moved to Edmonton to work at the Shaw Conference Centre, where he now manages the day-to-day operation of the busy kitchen that routinely produces meals for up to 5,000 people. Part of his job is to manage and mentor the Shaw’s stable of junior sous chefs, and he has become part of the go-to team for creating VIP meals. In recent years, Belair’s skills and creativity have earned him a reputation that has spread well beyond the city limits. In 2012, he won the Canadian Culinary Federation‘s Chef-of-the-Year Challenge. In 2013, he earned silver at the World Association of Chefs Societies‘ Global Chefs Challenge and gold and silver medals at the Culinary Olympics as a support team member for Team Canada. “The adrenalin you get in the kitchen, there’s nothing compared to that,” he says of cooking competitions. Over the years, Belair has also been a competition judge, made many TV appearances and volunteered for several local charities. Always pushing his limits, Belair says cooking is a constant exploration of new flavours and techniques. He loves the wide variety of cultural flavours that exist in Edmonton – lemongrass and ginger are particular favourites – and loves creating with fresh, local ingredients. He enjoys the “anything goes” trend in modern cooking. At the same time, though, Belair remains firmly rooted in the skills he learned from his old-school French instructors, relying heavily on simple ingredients like butter, salt and pepper. “At the end of the day, you’ve got to stick with the basics,” he says.